You want to know more about the key terms mentioned in this dossier? Hereby we are delivering the explanations for the terminology of the "New Economy of Nature". Biodiversity offset credits are accounting units produced by compensation offset projects. Companies that pollute or destroy natural habitats can use such biodiversity offset credits to demonstrate that they have offset the damage caused. Such compensation increasingly opens up protected or biodiversity-rich areas to destruction (see also our article: What are compensation credits and why are they so controversial?). Road building, mining, the establishment of new industrial zones, hydrodams and wind farms are just some examples of interventions that negatively affect and often destroy natural habitats. Nature conservation laws usually require proof that avoidable degradation of natural habitat has been avoided or minimised. According to the hierarchy of 'avoid, minimise, offset', companies must offset or compensate the remaining destruction of natural habitat. Environmental legislation thus considers compensation or offsetting elsewhere as a last resort in the mitigation hierarchy – at least in theory. In practice, however, offsetting through compensation payments or biodiversity credits is increasingly being used to justify the destruction of biodiversity-rich habitats without serious consideration of the scope for avoidance and minimisation. Biodiversity offsets were first used in the USA in the 1970s in order to allow wetlands that were protected by law to be drained. Since then, more than 40 countries have introduced or revised environmental legislation permitting protected or biodiversity-rich habitats to be destroyed or pollution limits to be exceeded if compensation credits are submitted as evidence that the damage to biodiversity has been offset. In the early days, companies frequently undertook the offsetting themselves; now it is usually done by trading biodiversity offsets marketed by the biodiversity offset industry that has since emerged. More than 400 biodiversity banks and private businesses currently offer biodiversity offsets or 'ecopoints' for various habitats and combinations of species. Critics of biodiversity offsetting point out that the destruction of nature occurs immediately, while the success – or failure – of the offset project cannot usually be assessed for years, or often decades. They also argue that nature is unique in any one location, with a unique and distinct interaction of history, stories, species and habitat. By contrast, the trade in biodiversity offset credits is based on the assumption that a habitat or ecosystem can be reduced to measurable and interchangeable units. Methodological flaws have also been exposed – for example, where methodologies allow for the degradation of species-rich habitats to be offset by restoration of larger but less species-diverse areas at the compensation site. Supporters argue that without biodiversity offsetting there would be no compensation for destruction of natural habitats at all. The terms biodiversity offsets and biodiversity credits are used synonymously. If a product or activity is described as 'climate neutral' or 'CO2 neutral', greenhouse gas emissions caused by the manufacture or use of the product have been offset through the purchase of carbon credits or evidence that emissions have been prevented that would otherwise have been released. Such offsetting involves two sets of calculations: calculation of the quantity of greenhouse gas emissions caused by the product or activity. This calculation determines how many carbon credits are needed to claim that a product or activity is "climate neutral". The second set of calculations is needed to show that the carbon credit represents emissions saved elsewhere that would have been released without the carbon offset project – in other words, the reduction must involve additional emission saving. If projects leading to emission reductions which would also have occurred without the offset project sell carbon credits for these reductions that would have occurred anyway, the carbon credit buyer's emissions will not be offset. The requirement for proof of additionality of an emission reduction is thus a key point in offsetting – and a central point of criticism: determining additionality requires that the offset project present evidence of the amount of emissions that would have been released without the carbon offset project. This calculation of hypothetical future emissions determines how many carbon credits the offset project can sell; it enables products to be described as ‘climate neutral’ even though their manufacture has caused greenhouse gas emissions – and even though the claim that these emissions have been compensated by additional reductions elsewhere is ultimately unverifiable. A compensation credit makes it legal for a company to exceed a limit set by law on pollution or the destruction of nature. The purchase of compensation credits as evidence that pollution or destruction of nature elsewhere has been prevented permits companies to market products as sustainable even though their manufacture destroys nature or causes pollution. The evidence that pollution or destruction would have taken place without the offset project is key. Compensation credits are at best a zero sum game: destruction or pollution at one location is offset by preventing pollution or destruction of nature that is (allegedly) planned elsewhere. If compensation credits are not based on additional reductions of pollution or avoided destruction of nature, they result in more pollution or destruction. Carbon credits are currently the most widespread form of compensation credits. Biodiversity offsets play an increasingly important part in the financing and approval of new mining and infrastructure projects that destroy biodiversity-rich habitats, both protected and biodiversity hotspots without formal protection. Brazil’s Forest Code of 2012 requires that landowners who illegally cleared land must restore this illegally cleared forest land within five years. However, the Code provides an alternative to restoration on their own land that allows land owners to continue using the illegally cleared land for cattle ranching or soy production: they can buy a reforestation credit. One of the places where such credits are traded is the private Green Exchange in Rio de Janeiro, which was set up specifically to handle transactions of this sort. Big food companies have begun to advertise supposedly ‘deforestation-free’ palm oil and soy products. However, deforestation is not necessarily avoided in the production of these products; instead, companies claim that deforestation has been offset through the purchase of compensation credits. See also net zero emissions. Offset projects of all types have in common the key problem that they sell credits based on an ultimately unverifiable calculation: on the determination of an exact, yet hypothetical quantity of pollution or destruction of nature that would have occurred at some time in the future without the offset project. The concept of 'economic valuation' of nature describes a set of assumptions, measures and calculations aimed at determining an economic value for processes and functions that ecosystems provide. Economic valuation of nature involves describing natural processes and functions in the language of economics ("natural capital", "ecosystem services") and developing units of measurement and measuring procedures that allow processes and functions in different locations to be compared and economically valued (valorisation). The goal of the economic valuation of nature is to establish economic parameters and accounting units for selected "ecosystem services" to which economic values can be attributed. These economic values make visible the ecological trade-offs resulting from economic development, thus reinforcing the consideration of nature in economic decision-making. Supporters often emphasise that an economic valuation of nature is not synonymous with the financialisation of nature or with markets for ecosystem services. All the same, it is of political relevance that economic valuation of nature promotes these mechanisms. The methods and measuring techniques that are developed can be used both for economic valuation and for the establishment of markets in ecosystem services. The concepts 'economic valuation' and 'valorisation of nature' are frequently used synonymously. The term ‘ecosystem service’ describes the functions and processes of natural habitats that are of direct or indirect economic, material, health-related or psychological benefit to humans. The basis of the concept is therefore the benefit to humans. The Millennium Ecosystem Assessment (MEA), a large-scale study initiated by the United Nations, sums up ecosystem services as the benefit that humans derive from natural habitats. Between 2001 and 2005 MEA identified 24 key ecosystem services worldwide. Ecosystem services are also referred to as ecosystem goods and services. See also natural capital. An emission certificate or allowance permits the release of one tonne of carbon dioxide (CO2) or an equivalent amount of another greenhouse gas. The number of emission certificates in an emissions trading system corresponds to a limit on emissions set by law for a specified period of time. At the start of such a commitment period, the licensing authorities distribute emission certificates to the companies covered by the emissions trading scheme. At defined intervals the companies must demonstrate that they hold an emission certificate for each tonne of greenhouse gas released by their factory. The accounting unit of emission certificates is carbon dioxide (CO2) or a CO2 equivalent. The CO2 equivalent provides an internationally recognised conversion rate that can be used to compare the relative contribution of different greenhouse gases to global warming. The reference value is the average global warming potential of the gas over a period of 100 years – e.g. emission of one tonne of methane requires a company to hand in 21 emission certificates, because the global warming potential of methane over a 100-year period is rated as 21 times higher than that of carbon dioxide. However, methane persists in the atmosphere for only about twelve years – but during that time the effect of the gas on the climate is 25 times that of carbon dioxide. A different choice of reference period would therefore have yielded a different CO2 equivalence value; for example, if the period on which the conversion is calculated were 20 years instead of 100, a company would have to hand in 84 emission certificates to cover the emission of one tonne of methane. Emission certificates and carbon credits are two different types of accounting units used in emission trading schemes. Emission certificates are handed out by the authority regulating the emissions trading scheme. The quantity of emission certificates handed out is equivalent to the emissions limit set by law. Carbon credits, on the other hand, are generated by offset projects in sectors or countries whose emissions are not limited by legislation; the purchase of a carbon credit enables a company to exceed a legal emissions limit. If an auditing company confirms that without the offset project emissions (now avoided by the offset project) would have been released, the project operator receives carbon credits as evidence that greenhouse gas emissions (that would otherwise have occurred) were avoided. These credits can be sold to companies whose emissions are limited by law. Emission certificates are also known as emission permits or emission allowances; emission credits are also referred to as offset or carbon credits. Emissions trading is a policy instrument that uses trading in pollution rights to regulate the release of a polluting substance for which a legal limit has been set. The best-known example is the trade in greenhouse gas emission rights which the Kyoto Protocol introduced internationally in 1997. It is the first United Nations climate agreement to establish a legally binding limit on the release of greenhouse gas emissions in industrialised countries in international law. In 2005, the European Union (EU) introduced an emission trading scheme to regulate reductions of large industrial sources of greenhouse gas emissions. The Emissions Trading System (ETS) regulates greenhouse gas emissions at more than 11,000 industrial plants in the EU. Emissions trading is often described as 'market-based' regulation of greenhouse gas emissions, because the legislation merely specifies a (national) limit on pollution but does not prescribe how businesses are to comply with this limit. Companies must hold emission certificates equivalent to the emissions released at their industrial plant during the period specified in the legislation. When emissions trading is introduced, companies are usually provided with emission permits free of charge, at least for an initial period of the scheme. If a plant’s emissions exceed the individual limit set for the factory, a company can either reduce emissions through the use of new technologies, or scale back production, or purchase additional emission rights from other businesses or on a trading exchange. If the plant’s emissions are lower than expected, the unused emission certificates can be sold. Until 2020 the EU Emissions Trading System also considers emission certificates and carbon offset credits as equivalent and permits companies to use emission credits (see also compensation credits) instead of emission certificates to cover their emissions. One of the points of criticism is that, especially in the initial period, the existing emission trading systems issued emission certificates to companies free of charge. Because the certificates can be traded, companies acquired assets without having paid for them – and the higher their emissions were, the more free certificates they received. Most companies received many more emission permits free of charge than they needed to cover emissions at their factories or refineries and were able to generate substantial profits from selling surplus pollution rights. All existing emissions trading systems that regulate the release of greenhouse gas emissions have a significant surplus of pollution rights, so that the prices of pollution rights provide no incentive to reduce emissions. Emission certificates are also referred to as 'emission permits' or 'emission allowances', while credits generated by offset projects are called 'carbon offsets' or 'carbon credits'. The financialisation of nature refers to initiatives that aim to make selected ecosystem functions visible to capital markets and policy-makers. Such ecosystem functions include water filtration, carbon storage and erosion protection – functions from which humans benefit but that natural habitats perform without human intervention. Financialisation of nature initiatives translate these ecosystem functions into the language of the financial markets: thus, nature is redefined as "natural capital", and the storage of carbon by peatlands or forests is described as an "ecosystem service". Furthermore, new accounting units are created so that these "ecosystem services" can be quantified, e.g. by determining how many tonnes of carbon are stored in a particular forest. The creation of measurable accounting units creates the basis for the commodification of nature: Having defined part of nature as "ecosystem service", it becomes possible to determine their quantity and compare their quality in different locations. Once they have been made quantifiable, functions of nature that were previously not for sale can be given a monetary value. Ecosystem functions performed by natural habitats become products which are either assigned prices or for which prices can be established by trading, e.g. as carbon or biodiversity credits. For these new products to become tradable, rights of ownership or use must be assigned. This results in the creation of new assets from which financial actors can, in turn, develop new financial products, e.g. derivatives based on emissions certificates or restoration credits (see also Emission certificate). Sometimes only this last aspect of the process is referred to as financialisation of nature, while the creation of new accounting units and their commodification are referred to as monetisation and valorisation. When the concept of financialisation is used in the broader sense, monetisation and valorisation only describe certain aspects within the process of financialisation. The expression new economy with nature is often used synonymously with the concept of financialisation of nature. The objective of the internalisation of external (environmental) costs is that the price of a good or service ostensibly tells the ecological truth. External (environmental) costs are understood as those effects of economic activities on uninvolved third parties or on natural habitats and biodiversity which are not reflected in the price of a good or service. This effectively means that no costs are incurred by the producer of the goods responsible for destruction or pollution or for the (over)use of natural resources and the resulting consequences. The price of the product thus does not tell the ecological truth because costs resulting from destruction or pollution during the production process are not reflected in the price. The main criticism of the approach of internalisation of external costs is that it relies on quantification and measurability of ultimately unquantifiable qualities. So, although the concept suggests that the totality of external (environmental) costs will be recognised, unquantifiable forms of damage are still left out of the equation. Added to that, any internalisation immediately generates new externalities, since it is never possible to capture the complexity of interactions fully. The concept of natural capital was coined within the discipline of ecological economics at the end of the 1980s to articulate the fact that economic growth is destroying the capital stock of nature itself rather than using only the surplus growth produced by the capital stock. The implicit message: nature is a finite resource, and its continuing overuse must be prevented. Viewing nature as natural capital opens up ways to end this overuse. Transformation of nature into natural capital required nature's ecological functions to be expressed in economic categories; hence the label ecosystem services and the definition of accounting units for quantification of these ecological functions-turned-services. But despite decades spent researching and developing economic valuation approaches, definition of units that permit reliable and verifiable measurement and comparison of different "ecosystem services" remains controversial. The concept of 'natural capital' is undergoing a renaissance in economic analyses and political statements on the Green Economy. But here, the concept is used to mean something different and influential initiatives and programmes propounding the idea of nature as natural capital are losing sight of the principle, asserted by the co-founder of ecological economics, Herman Daly. His central point was that the economy has to be considered as a subset of the larger ecosystem and that economic growth needs to respect the ecological limits of that ecosystem. Daly advocated the definition of global threshold values to limit economic growth to an ecologically sustainable level. Daly's approach sees market-based instruments as an important method for distribution of the available natural capital. In this view, however, prices are primarily an instrument for regulating the distribution of a finite resource, and no matter how high a price someone is willing to pay, there could be no exceeding the stipulated ecological thresholds. "The biggest mistake in integrating economics and ecology is confusion about which is the Part and which is the Whole," Daly writes. Natural capital initiatives which promote trading in compensation credits, financing forest conservation or peatland restoration through carbon credits, or which carry out abstract price calculations, have fallen into exactly this trap. Their focus is on defining "ecosystem service" units whose quality and quantity can be compared across different locations. Such comparable units can be used to offset for destruction of the capital stock beyond legal limits, thus permitting destruction or pollution that exceeds ecosystem thresholds (and often also legal limits). The inevitable result of this approach is to redefine nature in a way that makes unsustainable growth appears 'green'. The concept of ‘net zero emissions’ is used in two different contexts. First, it describes the best possible result that can be achieved by carbon offsetting: no additional release of greenhouse gases in sum because the emissions in one place are offset by an additional reduction in emissions elsewhere. See also compensation credits. Second, since 2015 the concept of 'net zero emissions' has also been used in conjunction with the climate policy concept of 'decarbonisation'. In general, decarbonisation is understood to mean an end to the use of fossil fuels (coal, petroleum and natural gas). However, as the discussion about the target of net zero emissions stipulated in the UN Paris Agreement on Climate Change in 2015 demonstrates, decarbonisation need not necessarily mean the end of fossil fuel use. Instead of avoiding the emissions generated by burning fossil fuels by ending their use, 'net zero emission decarbonisation' leaves room for the use of controversial technologies to achieve the net zero emissions target. BECCS (Bioenergy with Carbon Capture and Storage) is an example of such a technology: Grasses and trees are planted on a large scale, the biomass they produce as they grow is burnt for electricity generation, and the emitted CO2 is subsequently pumped into geological reservoirs and stored there. Its supporters emphasise that not only does BECCS deliver net zero emissions, but also makes it possible to generate so-called negative emissions: Plants store carbon throughout their growth. With BECCS, this carbon is eventually stored in geological reservoirs, and thus removed from the atmosphere for a long period of time. What is being overlooked, however, is that the development of BECCS technologies is still at an experimental stage, and that substituting fossil fuel use with biomass would occupy vast areas of land, with inevitable consequences such as land-grab and increasing conflicts over land. BECCS is based on the development of CCS (Carbon Capture and Storage) technologies which capture, separate and store emitted CO2 in geological reservoirs. Many classify CCS as high-risk technology, and there are few if any CCS facilities operating on an industrial scale. Nevertheless, policy advisors such as the Intergovernmental Panel on Climate Change (IPCC) are citing this high-risk technology as a means of achieving net zero emissions. BECCS is one of a number of technologies known generically as geo-engineering, and more specifically, as a carbon dioxide removal technology. The concept of a 'new economy with nature' is often used synonymously with the concept of financialisation of nature where financialisation is not limited to the trade in financial products in the financial sector. Under a narrow interpretation of the term 'financialisation', the concept of a new economy with nature is understood as an umbrella term for the totality of approaches aimed at economic valuation, valorisation and financialisation of nature. It describes a multitude of processes and developments aimed at making the economic value of nature visible in economic terms. The assumption is that making the economic value of nature visible can prevent the destruction of natural habitats and finance conservation measures facilitated by introducing what is known as innovative financial products and market-based approaches. Among other instruments, these include emissions trading, trading in biodiversity credits, carbon credits for financing peatland restoration or reforestation programmes, reforestation credits (Brazil) and the introduction of nature bonds for specific conservation measures. Many of these instruments are discussed in conjunction with the concept of the Green Economy. Programmes that reward the protection of ecological services are often grouped together under the heading of 'payment for ecosystem services' (PES). The term 'payment for environmental services' is also used. The umbrella term PES covers payments of four different types: (1) programmes for the protection of selected environmental services through financial incentives as part of a regulatory system, e.g. the European Union's agri-environmental schemes. Or programmes that safeguard the conservation of forests in water catchment areas through financial incentives if such conservation would be hard to achieve through regulation, e.g. because the water catchment area lies outside the municipality; (2) programmes through which companies finance local nature conservation projects, frequently in the vicinity of the company's production sites at which excessive water consumption or pollution have resulted in conflict locally; (3) voluntary compensation programmes in which the level of financing is linked to verified protection outputs (e.g. projects financed from the sale of carbon credits that are sold to individuals or companies without a legal obligation to reduce their emissions); (4) protection or restoration of natural habitats financed through the sale of compensation credits. The credit entitles those who acquire it to legally exceed a legal or societal limit on pollution or destruction of a natural habitat. Programmes of types (3) and (4) have been particularly controversial. REDD stands for Reducing Emissions from Deforestation and Forest Degradation in Developing Countries. The basic purpose of REDD is to reduce greenhouse gas emissions from deforestation and forest degradation, thereby contributing to climate protection. Financial payments are expected to incentivise the prevention of forest loss. While REDD involves the avoidance of deforestation, REDD+ also provides financial rewards for emission savings resulting from forest conservation and sustainable logging. REDD was first introduced at the UN climate negotiations in 2007, and REDD+ has been recognized in the UN Paris Climate Agreement of 2015. How REDD+ is to be financed is unclear and has been a contentious issue from the outset. The financing of REDD+ is often described as 'results-based' or 'performance-based', because it is linked to verification of an emissions reduction. REDD+ is thus based on the proposition that the emission reduction through avoidance of planned deforestation is measurable and verifiable – a proposition that is questioned by critics, who cite a number of methodological deficiencies and assumptions. From a development perspective, the approach is criticised on the grounds that the emission reduction is necessarily linked to a change in land use. This change of use often involves restricting shifting cultivation and forest use for food production by peasant farmers. In many of situations, peasant farming practises are not the main driver of deforestation, however, and financial incentives often do not benefit the peasant families or indigenous peoples who live in the forest and are affected by the land use restrictions but whose land is claimed by others who control the REDD+ project. 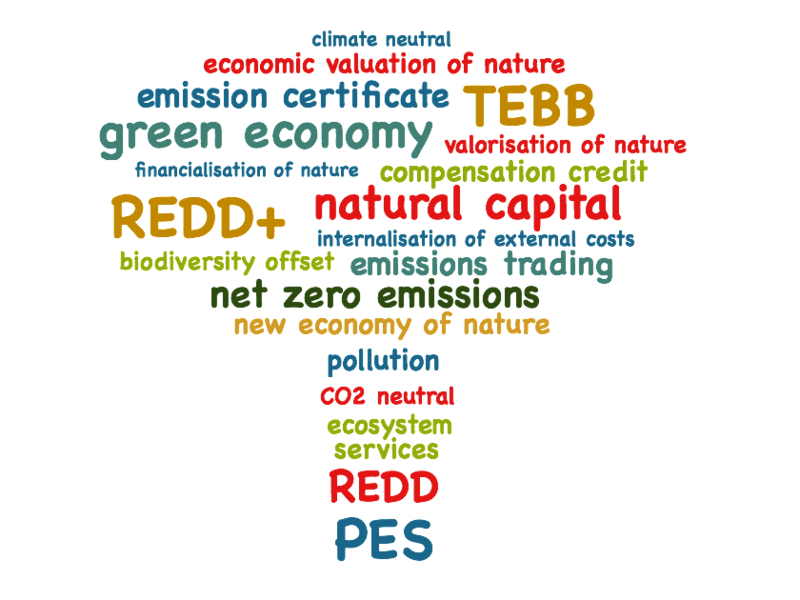 TEEB stands for The Economics of Ecosystems and Biodiversity. The initiative was launched in 2007, during Germany's presidency of the G8. The aim of TEEB is to demonstrate that conserving nature and using it sustainably pays off financially. The influential TEEB study was conducted under the auspices of the United Nations Environment Programme (UNEP). It collated data on the global economic benefits of biological diversity. These benefits were captured using economic performance indicators in order to make the economic impacts of biodiversity loss measurable. Placing a monetary value on ecosystem services is intended to highlight the costs of unabated damage and overuse of natural habitats and biological diversity. See economic valuation of nature.